KITCHENER, Ont. 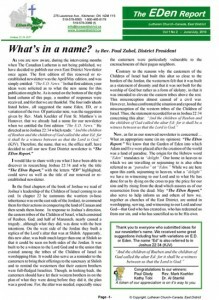 – What to name the new bimonthly East District newsletter? A general call went out for suggestions, and several people responded with variations on ED or Eden. Of these, The EDen Report made the cut as the new moniker. Tokens of appreciation went out to Paul Geddy, Kathy Tobi, Rev. Mark Koehler and Dr. Al Stanfel for their winning suggestions. 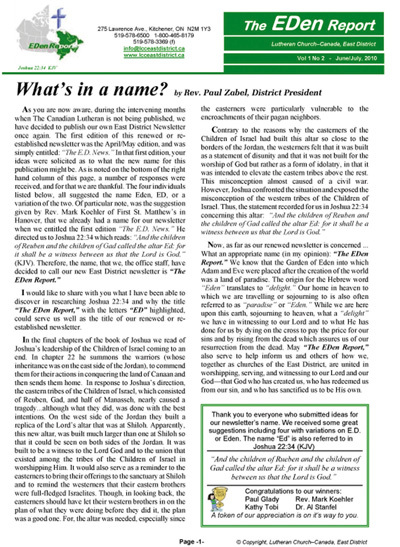 In the June/July issue, President Paul Zabel explains the scriptural reasoning behind the name. “And the children of Reuben and the children of Gad called the altar Ed: for it shall be a witness between us that the Lord is God” (Joshua 22:34 KJV). This verse gives the reason for the altar Joshua built on the west side of the Jordan: it served as a witness to the Lord and to the union among the tribes of the children of Israel in worshipping Him. The altar served as a reminder to the easterners to bring their offerings to the sanctuary at Shiloh, and a reminder to the westerners that their eastern brothers were full-fledged Israelites. Similarly, The EDen Report brings people together by informing congregations about how the churches of the East District are united in worshipping, serving and witnessing to our Lord—the God who created us, who redeemed us from our sin and who sanctified us to be His own. Issue one made its debut in April/May. The newsletter includes current news, a calendar of coming events, announcements, calls and vacancies, mission reports and business news. If you have ideas, suggestions or comments to improve The Eden Report, please don’t hesitate to submit them to the district office.